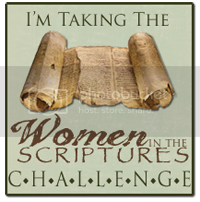 Women in the Scriptures: Celebrating My 3rd Blog-iversary! I am always astounded at how fast a whole year can go by. It seems like I was just celebrating the second anniversary of this blog a few months ago! Yet as I think back on the last year I am overwhelmed with such gratitude for all the wonderful women and men I have "met" through my blog. I have learned so much from you this last year and my testimony of the gospel has increased more than I ever imagined. You have been such a blessing in my life... and you probably didn't even know it! In celebration of my third "blog-iversary" I have the great opportunity to give away some beautiful gifts to 6 of my lucky readers! I am so grateful to the artists who are donating their products so that I can say thank you to you all in such a fun way. "We all must stand, first and foremost as servants of the One who came to serve us at our lowest point. 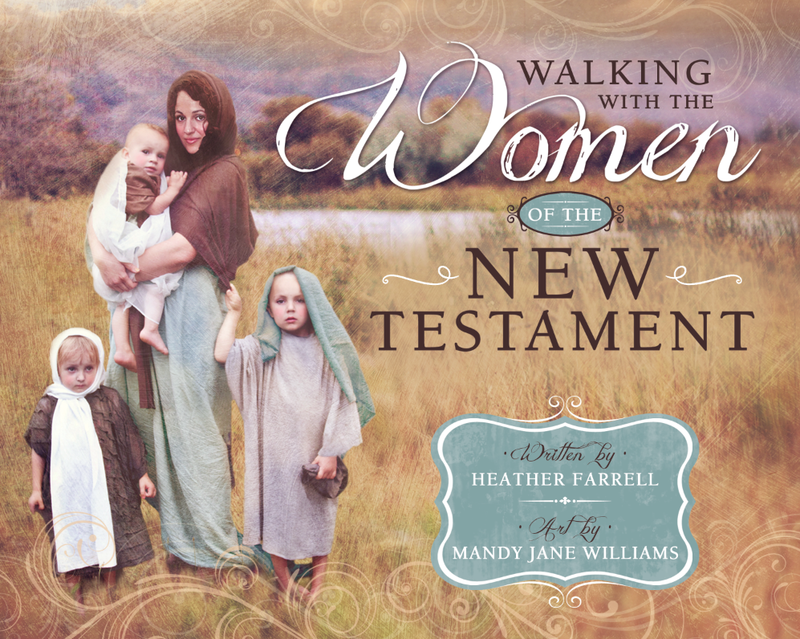 The woman holding the child stands firm on who she is as a follower of Christ. Nothing or no one will be able to separate her from this great reality. She may be surrounded by trouble on every side; she may be very weak on top of that; but she will stand, for the Lord is able to make her stand. It is theLord’s power which upholds us and defeats evil, not our power. 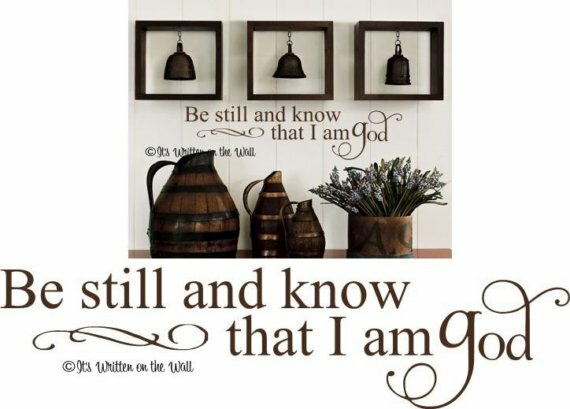 The battle belongs to the Lord, and many times He simply asks us to stand." 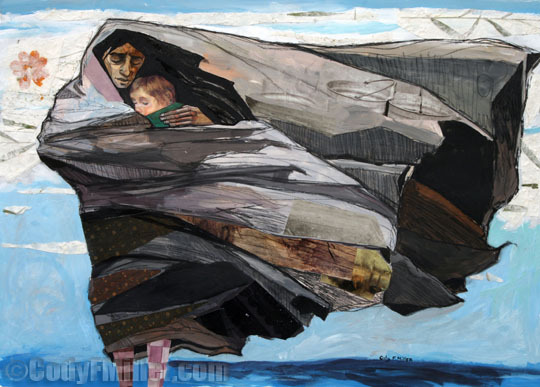 To see more of Cody's incredible art work you can visit his online gallery. I also especially love his paintings of Sarah and Deborah. They are stunning and so unique. 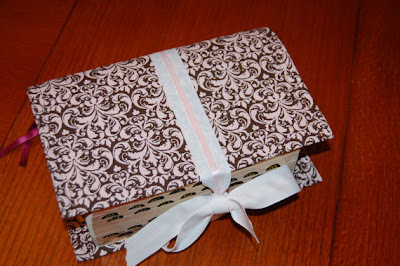 TWO lucky first prize winners will win their choice of a custom scripture cover from 4BsCreations! 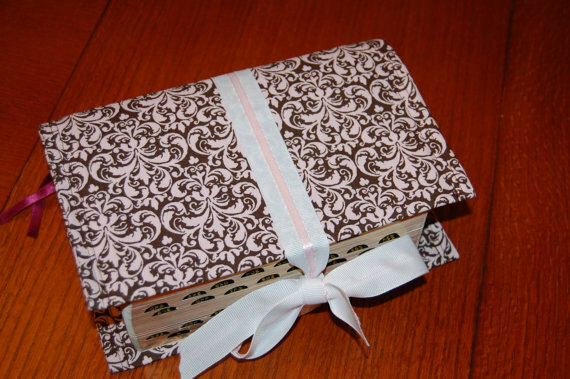 They make beautiful covers to help protect your scriptures and will make them to fit any size scriptures that you want. I SO need one of these for my scriptures. They get hammered being carried in my church bag and since they are so precious to me it would be nice to have a way to protect them! You can visit them on their etsy shop or "like" them on Facebook to see more of their beautiful work which includes everything from children's clothing to scripture cases. Monogramming is available on all their items. One second prize winner will win a $25 dollar gift certificate to the Nauvoo Store. "The Nauvoo store is an online store that brings together unique and high quality goods for the modern pioneer. We carry Book of Mormon and other Scripture covers, leather journals and bags, Young Women jewlery, Sunday clothing for children, baptism and mission gifts, soaps, candy, chocolates and art for the home. Come see us at http://nauvoostore.com/ or like us on Facebook." 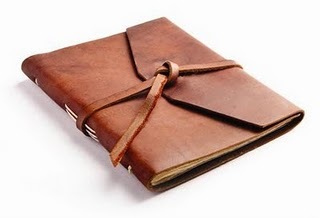 They sell the most incredible leather journals. This is one of my favorites. One of these would make the most perfect scripture journal! It would be such an heirloom to pass onto your children, or just something to feel really important writing in! 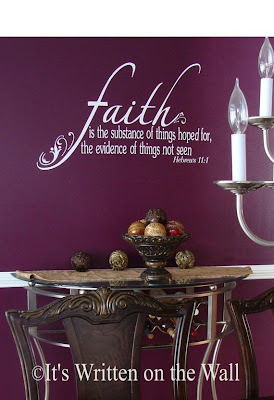 "We have over 400 vinyls designs for every occasion and every home... funny, whimsical, romantic, or inspirational. And if you can't find the perfect quote, we will custom-make one. Choose from 61 colors, make it smaller or larger. It’s all about you. All orders arrive gift wrapped. So they make great gifts because they can be mailed directly to the recipient!" I had such a fun time browsing through their website. They have some really cute things! I'd highly recommend you go and take a look at their esty shop or their blog and if you like them on Facebook you can stay abreast of their latest products! You can do one, two, or all of the following-- each one will give you an extra entry into the giveaway. Please leave me a comment letting me know which ones you did (you don't have to leave a separate entry for each). 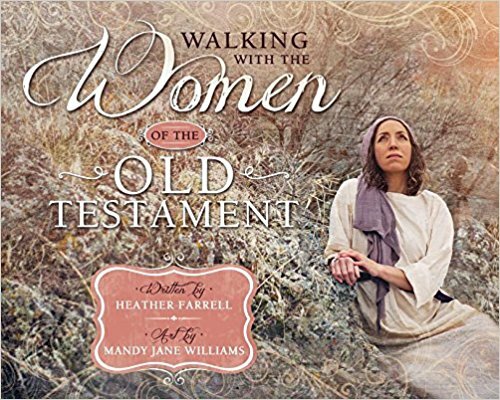 #1- Leave a comment telling me which woman from the scriptures you would want to spend an hour with (if you could go back in history) and what you would talk to her about. #2- Mention this giveaway and link to this post on your blog, Facebook, or twitter. #3- Become a "follower" (on the right hand side bar) of this blog (must be new). 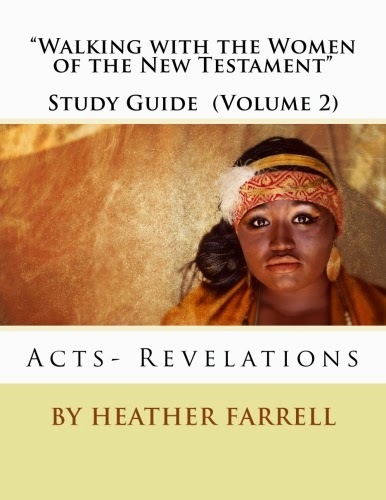 #4- "Like" Women in the Scriptures on Facebook (must be new). The giveaway will end on Sunday, September 25th at midnight. I wish I had the means to give all of you a gift but please know, whether you win something or not, how much I appreciate your friendship and support. You have really made the last three years wonderful! I mentioned you on facebook! I like you on Facebook, and I would love to spend a day with many women of the scriptures...but today I will say Naomi and Rachael. AND...I ama follower of this blog. And also, I would love to spend time with the Women in Jacob's time (Jacob chapters 2 and 3) I am very curious on how they stayed strong when their husbands were doing so much evil, and "grieved the hearts of their children and wife's" and how they kept trust in the Lord. (Those two chapters really helped me in the last few months, given me hope and strength, and now some good is coming forth.) I would want to tell them how much they inspire me, and how much I look up to them. My favorite woman in the scriptures is Ruth. She was so strong and so amazing, but I would also love to spend a day with Mary the mother of Jesus. I would love to be with her and feel her spirit and her heart. I am a follower of your blog, both here and on facebook. I follow your blog...I would most like to talk with Martha...and I pinned your Barbie discussion post!! =) Thanks! If I could spend an hour with a woman in history, it would have to be Eve. What an amazing conversation that would be! Love your blog, btw . . . happy anniversary! I've been following you for a about a year. Or Abigail who saved her village from David's wrath. I would love to see that moment of courage, or hear her talk about her meeting with David. I would want to meet Eve. I would love to hear her take on what it means to be a woman. She got her info from God, uninfluenced by society and man's craziness. 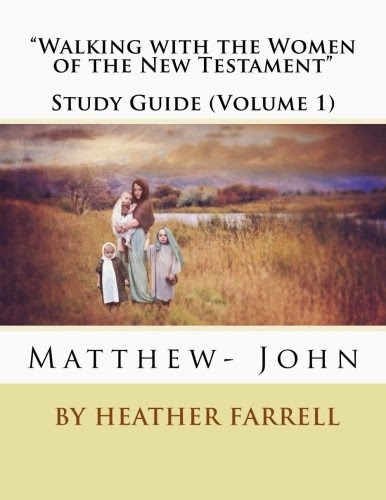 1- I think that I would love to sit with Mary and Martha from the New Testament. I would love to hear their actual testimonies of the Savior. I am sure they are beautiful and powerful. 2- I linked to the giveaway on Facebook. 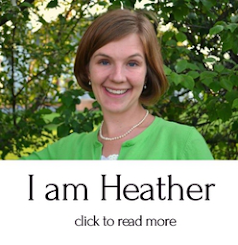 Congrats on the three years, Heather! You are so awesome, and I love your blog, of course. I will be reading as long as you are writing. I have been following on Facebook for a long time, as well as having your button on my blog. I did just add myself as an "official" follower of this blog. I think that there are lots of options for who I would want to spend an hour with, but right now I would say Mary Magdalene. I would love to talk to her about what it was like to be there for the crucifixion and resurrection of the Savior. Her testimony must be amazing! It's difficult to pin down one woman in the scriptures with whom I'd like to have a conversation, but for this moment I pick Mary. I would love to ask her about her experiences and hear her testimony. I like you on Facebook, I'm already a follower, and I put your button on my blog. oops, let me try that again.. The first woman who comes to mind is Abish. I want to know more about her conversion and her ability to stay valiant alone for so long. I am a follower...but I'm not new. I now follow you on FB. I linked a post (actually the one you sent me) on FB. And I liked the other 3 on FB as well. I also liked you on FB, and pinned your "importance of birth" post to pinterest! There are so many I'd love to know more about... but I've always been interested to know more about Abish... how she came to know the gospel, etc. and am commenting on your blog. I think if I could talk to any woman in the scriptures that it would be one of three--Esther, Emma, and Rebekah. I would like to just talk with them about what gave them their strength, how they coped with the challenges they faced, and what advice they would give me as a mother in the latter days. I like you so much I like you on Facebook. :) I also have your blog button on my blog. As for which woman I'd like to spend an hour with...I think right now I'd choose one of the women who was with Jesus in Jerusalem, who helped prepare his body for burial, and who found the empty tomb and spoke with the angel. I'd like to know just their basic lives. What they did all day, how the taught their children, how they supported their husbands. I'd like to know how they came to their testimonies of Christ and what a face to face relationship with Him was like. What was it like to converse with Him? Congratulations on your blogiversary. I love your blot, and I think you are doing great work. I look forward to your fourth anniversary! Happy blogging. Wow! Congrats on three years! I love your blog- thank you. And I would love to meet Mary. What an amazing woman! 1. I would love to spend an hour with Mary, mother of Jesus. I have always wondered what her thoughts were and what she struggled with when she was "raising" the Savior. It would be so interesting! 2. I am a new follower of your blog! 3. I just liked you on facebook! I think I'd like to talk with Jael. Well, that's a bit tongue-in-cheek, but I always kind of admired her for having the strength to be an assassin! Puah and Shiphrah. I'd want to know all their midwifery tricks and tips! Happy Bloggiversary!! I found you in 2009 and you don't have any idea how much your blog has influenced/ inspired me. I would love to meet Eva and Rebekah. My favorite ones. I even have named my two little girls like them! I liked the pages on FB. I definitely would want to talk to Sariah. How do you raise a Nephi? What would you have done differently with Laman and Lemuel? -I liked your facebook page! Hmmmm...Eve, of course, how did she do it...!!! I shared this on facebook! One of the woman I would love to meet would be Mary, the Mother of Jesus. 1. I think I would like to meet Sariah. 3. I just liked your facebook page. I would like to spend an hour with Emma Smith. I linked to your guest posts about Emma from both my blog and FB. I would love to spend an hour with Abish, and talk with her about her father's visions, and how she stayed faithful with so much wickedness around her. 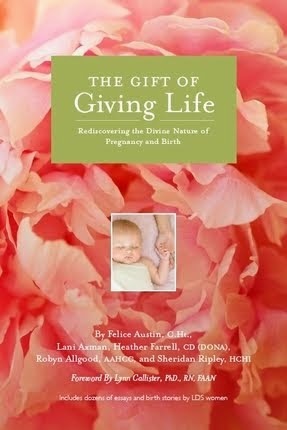 Pinned this blog and a post about the mothers of the stripling warriors on my pinterest boards! I now "like" women in the scriptures facebook page. im new! im now a new follower of your blog! i mentioned this giveaway and attached a link on my facbeook page. I have always liked Ruth in the bible. Im not sure why-I guess because she was brave and loyal to her family. I'd love to speak with Mary--Jesus' earthly mother. I bet her parenting techniques would be helpful!!! 1) I would want to go back in time and talk to Sariah, Lehi's wife. 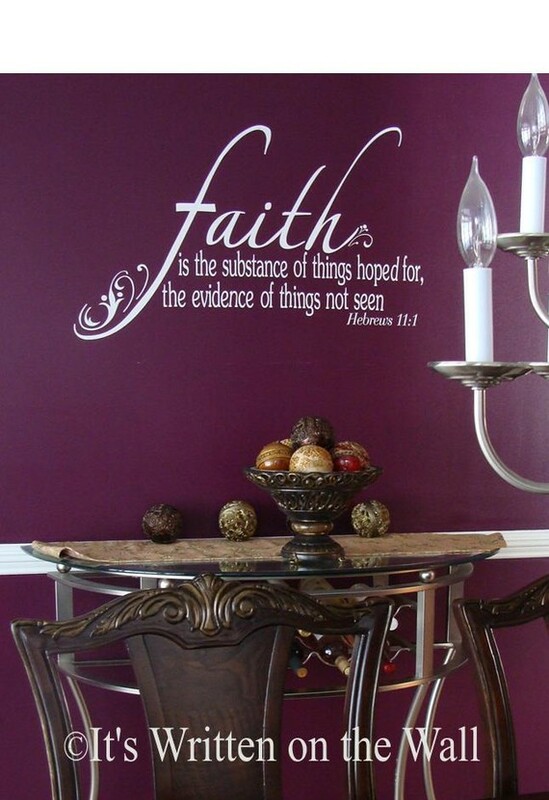 What faith she had to have! And to be an example for all the women in her family! Thanks for the chances for this blog! If, by chance, I win anything, I don't think I have it set up to email me through blogger so my email address is kmgourley at gmail dot com. I'd love to spend time with Eve. I got heaps of questions about how she and Adam were taught the gospel, and then how she taught her family. And survived! I bet she found joy in her journey. I've liked you on Facebook. I cannot decide between Eve and Mary, I hope someday to spend time learning from them both as I learn so much from their examples now! I don't know how I missed this post! Congrats on your anniversary! I would have a hard time deciding between Eve or Mary to talk too. I named my two oldest after them because of their roles in God's plan. I liked this blog on Facebook. I pinned Getting Adam to partake on my pinterest board "Worth Reading Again." I would want to meet Mary, the mother of Jesus. I often wonder what her life was like and what it was like to be the mother of the Savior. Did she know? How did she feel about what she knew? I wonder if she was lonely. According to the scriptures there were many things she "kept in her heart" so I imagine there were many things she couldn't talk about with anyone. I would want to spend time with Priscilla. I've often wondered if she was perhaps, very much like a Relief Society President. I'd want to hear her testimony from her too, and just absorb her story from her view. What a wonderful giveaway! I think I'd like to talk to Eve, and talk about motherhood! I posted about the giveaway with a link on Facebook. I "liked" all three on Facebook. I would love to talk to Emma Smith. I think she is a modern day Mary in so many ways. Her testimony of the church in these Latter Days is something I would love hear and impact my own.